The Milwaukee Brewers have announced the return of a unique ticket promotion known as the “Brewers Chance 2 Advance Ticket Plan,” which allows fans the chance to upgrade their seats to the next highest ticket category every time the Brewers win. Only a limited number of plans will be available, and they go on sale tomorrow, Wednesday, March 4. Tickets for this promotion sold out in 2013 and 2014 – the first two years of the promotion – so fans will want to act quickly. 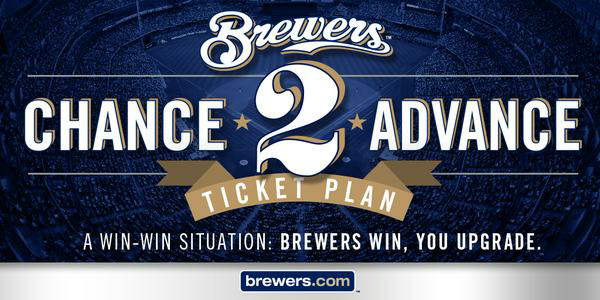 Last season, the Brewers won five games during the promotion and fans that purchased this ticket plan advanced to the Loge Infield Box. Here’s how it works: For just $99, you get tickets to nine select Tuesday games at Miller Park, plus the chance to advance all the way to the Field Diamond Box. You start with seats in Bernie’s Terrace for all nine games, but with each Brewers win, you upgrade your seating area. On Tuesday, May 12, you’ll sit in Bernie’s Terrace for the first game of the plan against the Chicago White Sox. If the Crew wins, you’ll advance to the next seating tier for the following game in the plan. Every time the Brewers win, you simply exchange your Bernie’s Terrace ticket for a ticket in the next best seating area for only $2. You remain in that seat location until the Brewers win the next game in the plan. If the Brewers don’t win, simply exchange your Bernie’s Terrace ticket at no cost for a seat in the same section where you last advanced – no backsliding. Ticket upgrades must be done in person at the Miller Park Ticket Office (between Windows 1-12 located behind home plate) anytime between the conclusion of the previous game and the start of the next game in the ticket plan. Box Office hours are Monday through Friday from 9 a.m. – 7 p.m.; Saturdays from 9 a.m. – 5 p.m. and Sundays from 11 a.m. – 5 p.m.
Tickets for this plan will be available tomorrow, beginning at 10 a.m. Tickets can be purchased by calling (414) 902-GAME (4263) or by visiting Brewers.com/advance. Service fees apply. Beginning tomorrow, January 27 at 9 a.m. and continuing through Monday, February 16 at 11:59pm, fans can go to Brewers.com and register for the opportunity to purchase up to four tickets to Opening Day on Monday, April 6 against the Colorado Rockies. Due to limited availability, the Opening Day Ticket Opportunity includes single seats, standing room only and some obstructed view seats. In addition, fans can register for a maximum of eight tickets to each of the weekend games (Friday-Sunday) at Miller Park. Following registration, a pool of randomly selected winners will be chosen and provided access to an online pre-sale opportunity, based on available inventory. The winners will be notified on Friday, February 20. Fans who win the chance to purchase tickets for Opening Day will be able to purchase tickets starting on Tuesday, February 24 at 9 a.m., while fans who win the chance to purchase tickets for weekend games will be able to do so starting on Wednesday, February 25 at 9 a.m. Meanwhile, there are still options available for fans to guarantee their place at Miller Park for Opening Day and other popular games with 10-Packs starting as low as $160. Each 10-Pack includes 10 Brewers home games, plus a bonus of Opening Day or any other game of the fan’s choice absolutely FREE. Fans interested in purchasing 10-Packs are encouraged to call 414-902-HITS (4487) or visit Brewers.com/10packs for more information. As the calendar turns, each day brings us one day closer to the return of Brewers Baseball. Fans can secure their tickets to Opening Day for free with a Brewers 10-Pack, which go on sale tomorrow at 10 a.m. There are six enticing plans to choose from, including the popular Fan’s Choice Plan which returns for 2015. All plans feature 10 home games, plus Opening Day or any other game of the fan’s choice as their FREE 11th game. In addition to tickets to Opening Day, each of the six plans offer a unique experience. The Weekend Plan features four giveaways, including the Mother’s Day Bobblehank on May 10, June 14’s Carlos Gomez All-Star Bobblehead, a bobblehead of National League All-Star Jonathan Lucroy on August 16 and an All Fan Giveaway item to be decided by fan vote and distributed on the final day of the regular season, Sunday, October 4. The Premier Plan includes contests against all four division rivals as well as a matchup against NL West Division rival, the Los Angeles Dodgers, on May 6. The Friday Plan includes a string of five “T-Shirt Friday” giveaways starting with the June 12 game against the Washington Nationals and ending on August 14 when the Brewers host the Philadelphia Phillies. To top it off, the Friday Plan includes access to the first ever Brewers Postgame Concert Series when country artist Joe Nichols rocks Miller Park after the May 29 game against the Arizona Diamondbacks. The popular Fan’s Choice Plan returns for the 2015 season and provides the ultimate flexibility for fans to select 10 games that fit their schedule from a list of 49 Brewers regular season home games. The plan can include several Interleague matchups, a variety of weekday and weekend games, All-Fan Bobblehead dates, T-Shirt Fridays, and more. A complete list of all six 10-Pack’s including the Fan’s Choice plan, is attached. Packages start at $160 per seat in the Terrace Reserved ($16 per game) and can also be purchased in the Terrace Box for $250 ($25 per game), the Loge Outfield Box for $340 ($34 per game), the Club Outfield Box for $420 ($42 per game, no wait staff), the Loge Infield Box for $420 ($42 per game), the Field Outfield Box for $420 ($42 per game) and the Loge Diamond Box for $500 ($50 per game). Brewers 10-Packs offer several benefits, including a free ticket to Opening Day (or any other home game on the 2015 schedule), guaranteed seat location, a personal account representative and priority access to Postseason tickets. In addition, 10-Pack Ticket Plans offer great savings on ticket prices. Last season, 10-Pack holders saved up to 35% off the demand-based individual game price. Each 10-Pack account will also receive three (3) exchange vouchers that can be used to exchange tickets you cannot or did not use for tickets to another game. Fans interested in purchasing 10-Packs are encouraged to call (414) 902-HITS (4487) or visit Brewers.com/10packs for more information. Fans can share in the excitement of counting down to Brewers Opening Day by following the Brewers on social media and also enter to win a pair of 10-Packs, tickets to Opening Day and roundtrip airfare on Southwest Airlines—by posting their creative countdown photos on Twitter and/or Instagram using the hashtag #SeeUApril6. The Milwaukee Brewers have announced details for a Postseason Single-Game Ticketing Opportunity that will give fans the chance to register for the right to purchase tickets to potential individual 2014 Postseason games held at Miller Park. Beginning today at noon CT., fans interested in registering may go to Brewers.com and look for the link to “Postseason Single-Game Ticketing Opportunity.” With inventory expected to be very limited, it is likely that only a very small number of fans will be selected to purchase tickets through this registration opportunity. Registration will begin at noon CT today and will close at 11:59 p.m. CT on Sunday, September 21. The Brewers will conduct a random selection of winners from the pool of registrants for each Postseason series. The Wild Card and National League Division Series (NLDS) winners will be selected on or around September 23 and will have the opportunity to purchase up to four (4) tickets to one (1) game of the 2014 Wild Card or NLDS. Winners for the National League Championship Series (closes Wednesday, October 1) and World Series (closes Sunday, October 12) will be selected from the same of pool registrants at later dates. Registrants (including winners of previous drawings) will be eligible for each drawing. There is no charge to register for this opportunity, and additional rules and information are available at Brewers.com/postseason. The first option is for fans to purchase a Full Season Ticket Plan for the 2015 season. Fans who select this option will be given the opportunity to purchase tickets to ALL 2014 Postseason games at Miller Park, including the World Series. The second option is for fans to purchase a 20-Game Plan for the 2015 season. Those who choose this option will be given the opportunity to purchase tickets to all 2014 Wild Card, NLDS and NLCS games at Miller Park. Fans interested in either one of these two options can visit Brewers.com or call 414-902-HITS. Looking to Save on Ticket Purchasing Fees For Brewers Games? The Milwaukee Brewers have announced a one-day promotion known as “No Fee Friday,” which features the Brewers covering the cost of all ticket transaction fees for online and phone orders placed this Friday, August 15 between 9 a.m. and 11:59 p.m. CT. The one-day promotion is valid for any remaining 2014 regular season games at Miller Park. There are 19 home games remaining on the Brewers’ regular season schedule, and fans can purchase tickets to any of them and not be charged with transaction fees. But the offer is only valid this Friday. For instance, if a fan purchases two tickets for the game on Saturday, September 6 against the St. Louis Cardinals, the fees associated with those tickets would be covered by the Brewers – as long as they are purchased this Friday. Upcoming games include an Interleague matchup against the Toronto Blue Jays and a three-game weekend series vs. the Pittsburgh Pirates on the team’s next homestand from August 19-24. September’s schedule features an 11-game homestand against the St. Louis Cardinals, Miami Marlins and Cincinnati Reds from September 4 – 14. The team closes the regular season schedule with a three-game weekend set against the Chicago Cubs from September 26 – 28. A variety of giveaways, including three All-Fan bobblehead dates, remain on the schedule, along with Fan Appreciation Night presented by Chevrolet on September 27. Tickets can be purchased to any remaining Brewers home games by calling (414) 902-4000, online at Brewers.com or by visiting the Miller Park ticket windows. All tickets are subject to availability. No refunds/exchanges. The “No Fee Friday” promotion cannot be combined with any discounted or special offers. The Milwaukee Brewers will offer a special ticket promotion tomorrow only in which tickets for the team’s next home game – Monday, July 7 against the Philadelphia Phillies – will be available for just $7 for (most) seating sections that end in “7.” This includes the following 14 seating sections: 107, 127, 207, 217, 227, 237, 307, 317, 327, 337, 407, 417, 427 and 437 (ticket offer does not apply to section 117). Tickets for tomorrow’s promotion will be available at Brewers.com/seven. Tickets will go on sale at 9 a.m. CT tomorrow and will be available for purchase until 9:57 p.m. CT tomorrow (777 minutes), or while quantities last. There is a limit of eight tickets per person. The “777” ticket promotion for the 7/7 game is sponsored by Potawatomi. I’m giving away a ticket in Section 115 to tomorrow afternoon’s Milwaukee Brewers vs. Baltimore Orioles game at Miller Park. If you can’t go, please don’t bother entering. It’ll save me time later. If you can go, please answer the following multi-part trivia question via your preferred social media network. If you tweet, be following me at @BrewerNation. If you respond on Facebook, be sure that you “Like” the page at http://www.facebook.com/BrewerNation. You have until 8pm CDT on 5/25/2014 to enter. I’ll draw the winner shortly thereafter and announce it via all the social networks. Whose contract did the Brewers purchase on May 25, 2014? How was he acquired by the Brewers last offseason? When did he make his Major League Debut? Please remember that you need to answer all three parts of the question correctly to be eligible to win.